It finally time to reveal the new Block of the Month I have planned for 2012. It has been months in the planning and I am getting ready to start sewing. I will be sewing along with all of you on this project, as I am making 2 different versions. Ok, getting ahead of myself. It all started about 6 months ago when I saw an absolutely stunning applique signature quilt from the 20’s 30’s on eBay. I fell instantly in love with this quilt and tried to buy it but the price was waaaay out of my range! What I did get was a picture of the quilt and the crazy idea to make an adaptation of it from the picture. Oh my! What a challenge that was. The picture was poor quality and low resolution and many of the blocks were difficult or impossible to see in the photo. I started researching 30’s signature quilts and amassed a wealth of information on the type of blocks, fabrics, and even the signatures used in these old quilts. 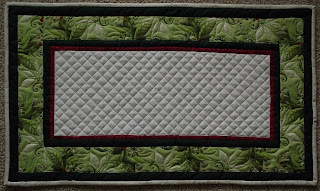 I was able to recreate many of the blocks from this old quilt and fill in with additional blocks from the 1920-30’s. It was a fun project and one I just couldn’t let go of until I had the whole thing drawn. So finally, here are all 42 blocks of the 2012 Block of the Month: Vintage Floral Sampler! It is all applique, and my patterns will be given in 2 parts. You will be able to download a full sized applique placement guide of each of the 9” floral blocks. Then I provide full sized REVERSED templates for use with fusible web. Throughout the spring I will be posting instructions and tutorials on my blog on how to do fused machine applique. Of course you can adapt it to whatever form of applique you prefer. I will be making one of my models using Moda Bella Solids and the other using batiks. I have several wonderful pattern testers who are busy making up blocks in other fabrics and color ways and their work is just wonderful. Wait till you see their samples!! 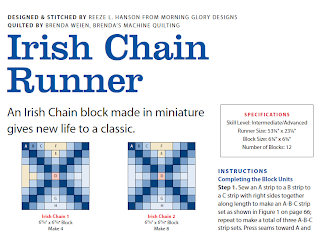 My newsletter subscribers will get a special bonus: For each block I have designd a “crossing block” – four motifs arranged in a crossing or “X” style in a 12” block size. I have also done a 16” wreath block featuring a variation of each block using 6 repeats of the basic motif. These are really stunning and would be a great project for intermediate and advanced quilters. These special block patterns will be available free ONLY to my newsletter subscribers. Others may purchase these block patterns from my website. Now here are the rules which govern this year’s BOM. I love to design and share my work but it reflects literally hundreds of hours of my time. I will ask that you respect the requests I make for the use of my work. I will release two blocks each month – one on the first of the month and the second on the 15th of the month. Each pattern will be available for free for 30 days only. Once removed, blocks will be available for purchase on my website. They may be downloaded and printed for personal or charitable use only. You may not print and share them with others, but you are free to direct others to my blog or website (www.morningglorydesigns.net) where they will be able to download a copy for themselves. These patterns are copyrighted and may not be sold or used for commercial purposes of any kind without the specific written consent of Reeze Hanson. Patterns will only be available as downloadable PDF files and requests to receive patterns by email will not be honored. You will need to download a current version of Adobe Reader (available for free) to open and use these files. Of course I want to start off my new BOM with a Bang!! so I will do a Give-Away! Leave a comment on this post and you are entered to win a Free Pattern of your Choice!! Leave a comment stating that you have placed a link on your blog or website (include URL) and you will be entered to win a Free Fat Quarter Pack!! 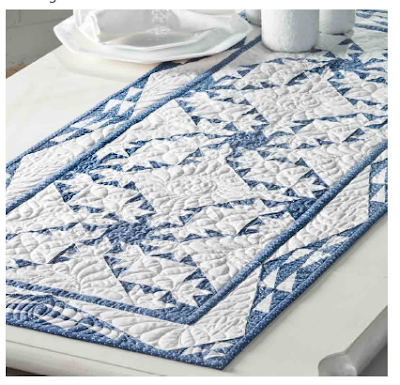 February Issue of Quilters World -- 2 Quilts!! 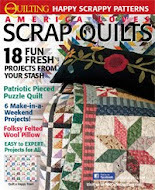 The February 2012 Issue of Quilters World is on the News Stands and there are 2 of my patterns in this month's issue!! You have seen these before on my blog but it is always so fun to see them in print. The first was made by my super good friend Peggy Hartnett of Powell, OH -- who despite quite a lot of "complaining" about the difficulty of this pattern, put it together beautifully!! 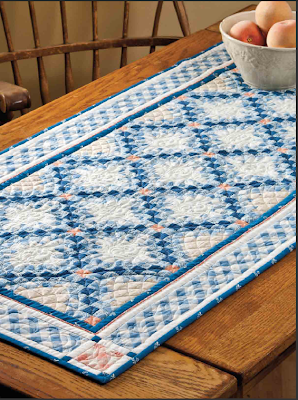 Brenda Weien's fabulous quilting is featured on this quilt as well. And I gotta tell you, it is really pretty. I wish I could keep it, but its going back to Peggy who did the real work on this one. The design was adapted from an old quilt I saw on ebay. 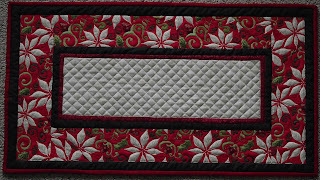 McCalls Quilting was interested in a full size version of this runner, but eventually ruled it out as being too difficult for their readers. Well, I never!! I think McCalls readers can paper piece with the best of them!! The tough part of this quilt is getting the right color on the right piece. But then. . . there are only 2 colors so you pretty much can't go wrong. . . well, ok, you can, but not if you are careful. See Peggy, they even printed your NAME!!!! 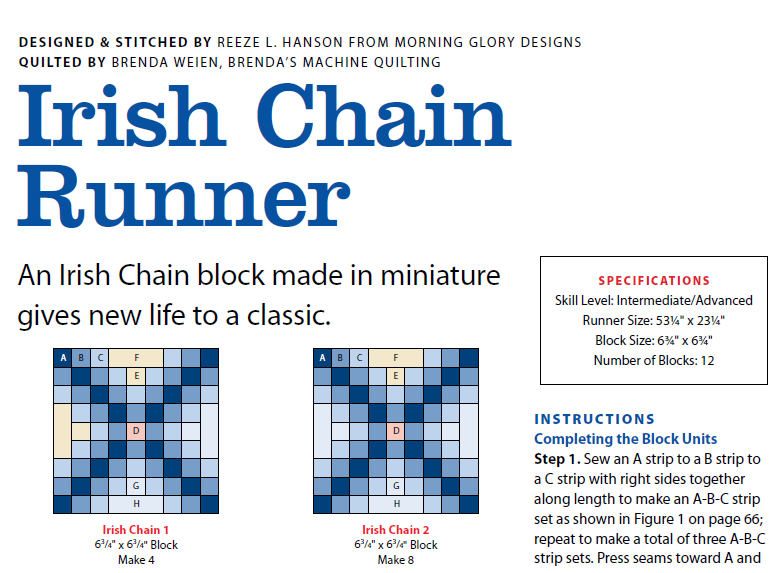 The other quilt in this issue is a simple Irish Chain runner that I designed just for the fun of it. The fabric line is Farmhouse Retreat by Andover Fabrics, and it worked up very easily. This is a much easier quilt to piece, as long as you follow the color placement instructions on the strip piecing. 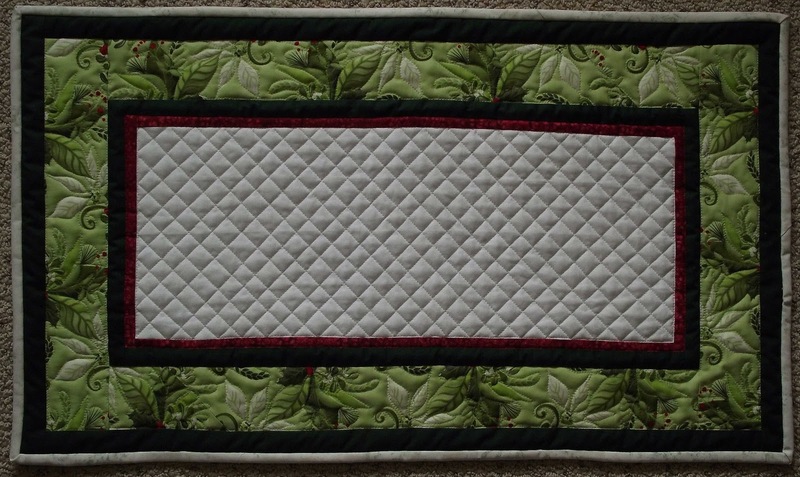 I just love designing quilts that challenge the eye as well as the quilter. 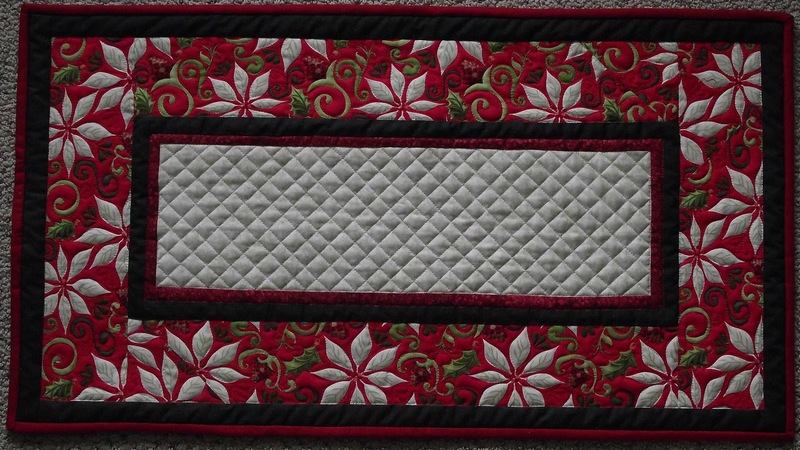 But they are really simple techniques that any careful quilter can do. That's the fun of designing for me. Make it look complicated but make it super easy. And of course, Brenda's quilting adds the 'piece du resistance'!! Check out her curved cross hatching around the inner edges. She just amazes me. By the way, Brenda does a regular feature for "On Track" magazine (now edited by my good bud Kathi Eubank) where she reviews new gizmos and gadgets for long arm quilters. 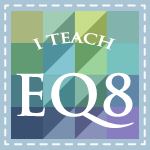 She does a great job testing and talking about new rulers and thing-em-a-bobs on the market. Congrats to Brenda (and Kathi)!!! And hang on because the new 2012 BOM is just about ready to start. I am soooooo excited about this quilt. I have been working on this pattern for months and months, it seems, and it is almost ready to begin. 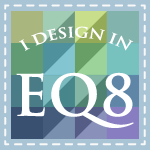 I have a group of really great pattern testers, Jean, Ellen, Charlene, and Linda's "Second Tuesday" Quilters who have been making blocks and testing the patterns, fabrics, and helping me refine the block designs. Their input has been invaluable, and wait till you see their blocks!!! They are just fabulous. One last item for this post. I just have to show you these wonderful table runners made by Betty King, who won a great set of fat quarters as part of the 2011 Jewels BOM monthly give-away. Look at these three incredible table runners Betty made from her winning FQ's. Didn't she do a fabulous job?? Thanks so much Betty. You totally rock.